This years Fall Speech Contest theme was Humorous Speeches. There were two categories, full length (5-7 minute) speech and table topics response (1-2 minutes). Today at TechMasters, we had a special guest stop by. Jhankar Mahbub and Vince met at ThatConference a couple years ago. He's a very accomplished speaker in the Chicago area. Very low-cost event on Saturday August 19 at Coffman Memorial Hall at the University of Minnesota, 300 Washington Avenue SE, Memorial Union Room 301 in Minneapolis. Congratulations to Marie Fromme on completing all 10 required speeches to and completing the competent communicator manual. Her last speech was "the entertaining speech" and it was an excellent performance based on high school hijinks in chemistry class. She is now entitled to two free advanced communicator manuals and a letter of accomplishment to her employer from Toastmasters. Twin Cities TechMasters 2017 Executive Committee. This morning, club President Vince Bullinger, Vice President of Membership Mike Benkovich (and his daughter) and Treasurer Brette Esterbrooks visited the Crest Toastmasters club in Eden Prairie. It is an advanced club filled with past district leaders that focus on improving Toastmasters clubs in the area. This was a great opportunity to not only get the Elusive Gilded Gavel (EGG), but also to connect with advanced Toastmasters and see how they run a meeting. We promoted our upcoming TechMasters After Dark event as well, and passed out a handful of copies of our flyer for the event. Now, other clubs will be visiting our club to not only see what we do well, but see if they can offer suggestions on how to improve. Also, we may snag members or dual members of other clubs if they like the way we run things or if they are technology-focused in their careers (as we are). Plus, we may end up in the district newsletter and on the EGG website. Visiting other clubs is always a great idea, but advanced clubs like this one are a special treat. 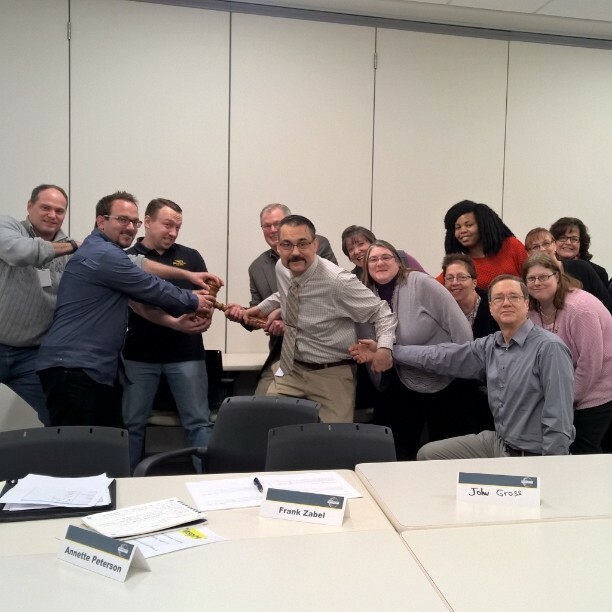 TechMasters – a Toastmasters chapter run by IT professionals in the Twin Cities – is hosting a Parliamentary Procedure in Action workshop. Tuesday, February 23rd at 6pm at ILM in Edina. Doors open at 5:30pm for networking and light food/refreshments. The workshop will be led by Mike Benkovich. With over twenty years of experience in Toastmasters, Mike has the knowledge and expertise to guide you through the process. When groups of people come together to get things done, we need a way to conduct business that follows established rules and help keep us on track. Since General Henry Robert introduced his rules of order in 1876, organizations have adopted its guidelines to give members and participants a way to be heard. In this hands on workshop, we start with getting a grounding on what the rules are and how they work. Then, we dive deeper to give participants an opportunity to demonstrate how to put them into practice. Join us for the Parliamentary Procedure in Action workshop. The post Announcing TechMasters After Dark: Parliamentary Procedure in Action appeared first on TechMasters - Twin Cities. We have a lot of exciting new ideas into which we’re really going to be diving very soon. We’re looking to make this the most exciting and dynamic year in TechMasters history. Stay tuned! We’re going to be much more active in the social networking space and look to dramatically increase membership! The post New Leadership Team! appeared first on TechMasters - Twin Cities. Did you know that visitors are always welcome at TechMasters. In the Edina location some members arrive around 7:30 AM and the meeting starts promptly at 7:40 AM. Visitors are still welcome to come after the meeting has started. We break around 8:15 and finish at 9:00, so we have a chance to welcome you even if you arrive after the meeting starts. Please stop over, sign our guest book and fellow members will be happy to talk with you about TechMasters. The full schedule for the Edina location can be found here. The post Did you know… appeared first on TechMasters - Twin Cities. © 2019 - TechMasters-Twin Cities. Disclaimer: The information on this website is for the sole use of Toastmasters' members, for Toastmasters business only. It is not to be used for solicitation and distribution of non-Toastmasters material or information. All rights reserved. Toastmasters International, the Toastmasters International logo and all other Toastmasters International trademarks and copyrights are the sole property of Toastmasters International and may be used only by permission.